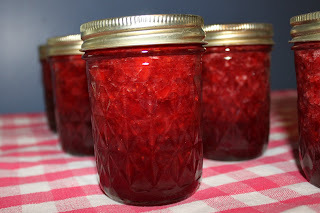 Yesterday I decided to make strawberry jam. I had some strawberries from my own patch and supplemented with a box from a local Farmer's Market. As I sliced them, I couldn't help but think about how marked up they were with little soft spots. A few minutes later, my daughter came in and asked if she could try one. As she put that juicy berry into her mouth, she exclaimed how delicious it was, especially as compared to the large, beautiful grocery store berries we buy before strawberry season begins here. There's a truth to be found here, isn't there? And it can be applied to all aspects of life. As humans, we have this tendency to go towards the big and shiny. We do it in the grocery store, don't we? The large, regular apples are polished to a bright shine, while the organic apples are not so big and not so bright. Most people, if given the choice, will go for the large, shiny apple. The same thing holds true for tomatoes, doesn't it? Supermarket tomatoes may look lovely, but they rarely taste lovely. We do this with people, too. We see the "beautiful" people and assume they are beautiful inside, as well. And sometimes they are! But we can't make any assumption based on how a person looks on the outside about what kind of a person they are on the inside. As I finished up my jam, I realized that if I am going to be using the produce from my own garden, it will be full of little insect holes and soft spots. That is the nature of gardening. But I know it will also have a much better flavor and be much juicier than those I find at the store. So when it comes to fruit and vegetables and people, we best not judge them by how they look. A good lesson to remember for today! p.s. I added this post to the Blog Hop at Frugally Sustainable. Go check it out for some great ideas!